The planning commission meeting in South San Francisco was so crowded the fire marshall had to ask people to leave the room. But after hours of public comment and debate the commission voted 6 to 1 to approve the application. More than 100 people wanted to voice their opinion about a proposed Planned Parenthood opening in an office building on Grand Avenue. Even before the meeting, opponents protested outside the proposed location. Property owner John Penna says protests and angry letters are not scaring him away from the debate: "This is a free country, if you can't do what you want then I don't want to live here. They are not going to intimidate me." 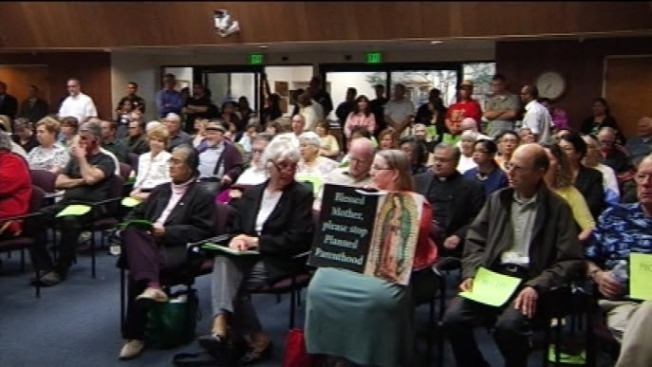 Most of the letters mentioned opposition to Planned Parenthood performing abortions, a procedure Penna and Planned Parenthood say won't be happening in South San Francisco. Penna says, "It seems to be the name people are objecting to because some facilities do surgical abortions which are not going to be done here." A spokesperson for Planned Parenthood says the clinic will provide basic health care and family planning to low income residents. Liz Figueroa says, "We've looked at the demographics and there is a need. We provide primary care for women and families." During the meeting opponents promised to step up protests and keep police busy. Steve Sanchez says he doesn't trust the organization, "I'm against abortion and against counseling to abortion." He also worries protesters will deliver on their promise and change the neighborhood, "All the protests not gonna stop right across the street from where I live." Opponents have 15 days to file an expected appeal.